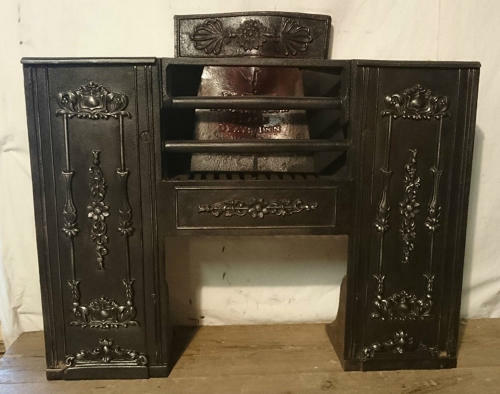 A wonderful Georgian, cast iron, hobgrate with the makers name cast into a back plate. The hobgrate was made by "Pearsons" of Calthorpe Place, London. The company was run by the Pearson brothers and was dissolved in 1842. Although one brother continued to make some fires it is likely that the fire dates to 1842 or earlier. The hob grate has delicate decorative features, with flowers and leaves running down the legs and crossbar. The top piece has a further flower design, typical of the era. The hob grate has an in-built grill and curved frontbars. The hobgrate has the traditional pan warming plates on either side. The fire has a slightly burnished finish that is pretty and stylish. The item does have some visible damage, with the makers plate heavily cracked and broken. The decorative top piece has also been damaged and is misshapen. The damage does give the fire great character, however, and highlights its age and history. The back has surface rust as expected and there are some scratches, marks and very small patches of surface rust to the front face. The hob grate would be wonderful in the kitchen of a period home or living room. A lovely piece of Georgian design.